The Pittsburgh Harlequins Rugby Football Association uses the gritty game of rugby to teach the blue-collar values of teamwork, integrity, and self-confidence to at-risk youth in Pittsburgh’s inner city. From the steelyards to the Steelers, Pittsburgh, PA is the epitome of a blue-collar city. With these principles woven into its rich history, it’s no surprise that the Steel City is also known as the City of Champions. Unfortunately, for a new generation of disadvantaged youngsters facing the hardships of Pittsburgh’s deindustrialized economy, those values are not as intrinsic as they once were. That’s where the Pittsburgh Harlequins Rugby Football Association comes in. 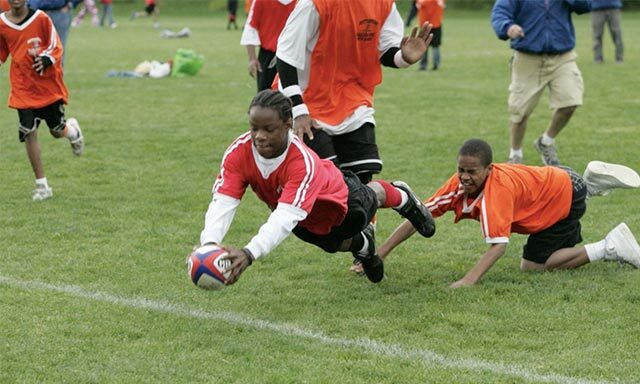 Founded in 1995, the Pittsburgh Harlequins Rugby Football Association is a non-profit youth mentoring program. Today, the Harlequins use patches of grass, oversized footballs, and a curriculum of athletic drills to teach the skills of leadership, self-confidence, and integrity to kids in at-risk areas. Rugby is a unique teaching tool because it creates a level playing field. In most cases, the participants have never played the sport before, so experience is not an advantage. And all body types and athletic skill sets have their place on the field. Unlike basketball or football, rugby isn’t flashy. It’s not a one-on-one sport. Teams earn success then they operate on the same page. When they literally lean on one another to march down the field, slowly and methodically. In rugby, every player has an effect on the game. In one of Pittsburgh’s inner-city neighborhoods, a young boy is being chased down by defenders. Knowing it would take a spectacular play for him to make it to the goal line, he tosses the oversized football to a teammate who catches it in stride and dives in for the score. In that moment, both boys understand the fundamentals of teamwork, trust, and communication. On that little patch of grass, they exude the blue-collar character for which their entire city is known.